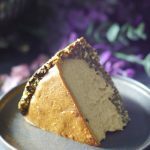 A few weeks ago this easy bake cheesecake happened, and it was everything you could possibly want in a cheesecake: it was light, tangy, dairy-free, and yet, YET there were a few of you who informed me that actually, there was one more thing you wanted. You wanted it nut-free. Most particularly, cashew-free. So back to the drawing board it was until this new nut-free version happened. I totally get this, because nuts can be a no-go for a lot of people (and I was one of them for years, so I get it). So I set to off to remove the nuttiness from an otherwise lovely baked cheesecake, and actually, I am sooooo glad you guys asked for this! Because even though I’m personally ok with cashews (and perhaps have been known to eat cashew butter straight from the food processor), this nut-free baked cheesecake turned out just lovely. I think I may actually like this one better than the original version, it’s that good. A dairy-free, gluten-free, oil-free, grain-free, refined sugar-free baked “cheesecake” seemed a tall order to begin with, and so removing the nuts from it too made it a bit of a challenge… although it was a challenge easily resolved with a few swaps. Cashews in the crust turned into pumpkin seeds (though sunflower seeds would work well too). Cashews in the filling got swapped out for sunflower seed butter… the result? YUM. Sunflower seed butter can have a particularly strong flavor to it, but when cut with yogurt, it turns into pure cheesecakey magic. I also added a few tbsp apricot jam and LOVED the new flavor it added. You can’t taste apricots, but you can taste a little something that makes it more special. One last note: the cake pictured has a thicker crust than what the recipe calls for. I doubled the crust originally but felt it was too much crust for cheesecake. So I remade it again with a thinner crust and it was just perfect, but sadly I didn’t get a chance to take new photos since that cake got served up to company before I got to that (they loved it btw :) ). So just note that the crust on your cake will be a bit thinner, but just as delicious. 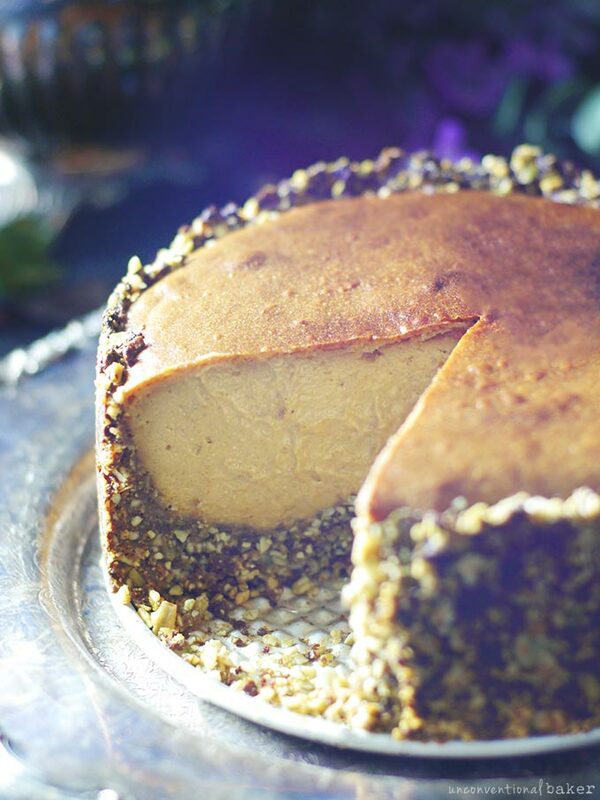 A creamy, nut-free vegan baked cheesecake with a sunflower butter and yogurt base. Preheat oven to 350F. Lightly oil a tall 6″ springform pan (base and sides) and set aside. Blend all filling ingredients into a smooth mixture in a power blender. Pour over the crust. 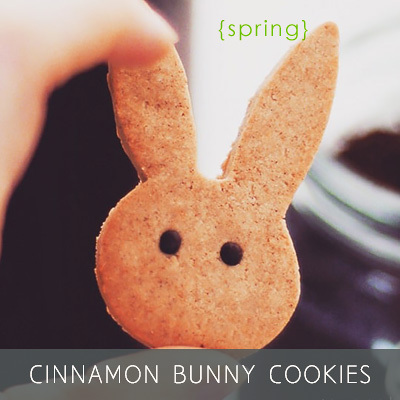 Disclaimer: this page contain affiliate links to the apricot jam and the springform pan I used for the recipe. Can I omit the psyllium husk? How does it alter the recipe? Hi! This looks AMAZING and I want to make it tonight but I need to make a regular large-sized cheesecake to bring to a friend. Do you know if this recipe will work for a large sized spring form pan and if so, would it be a doubled or tripled recipe? Thanks in advance for your reply!!!! I haven’t tried making a larger version myself, but a few of my readers mentioned that it worked for them, so I think it’s safe to try. Or alternatively you can just make two 6″ pan cakes instead. I’m assuming by “large pan” you mean a typical 9″ — if so, you’ll need to double the recipe. If I used psyllium husk powder how much do I use? Hi Sima. It should be 1 tsp powder. Enjoy! Aw, that’s awesome, Jen. So happy you liked it! :) Your comment made my day. Thank you so much! I was hoping for a cashew free version. Aw, so happy you liked it! :) Thank you for sharing. What can I use instead of sunflower butter? I don’t have any at home but I want to make this cake for tonight! Hey Vanessa. Sunflower seed butter is the only nut-free alternative I can think of. I tried it with tahini once — and while the texture held up well, the flavor wasn’t quite right. Pumpkin seed butte comes to mind, but it has such a particular flavor that it would need to be balanced somehow, plus the color isn’t great for presentation…). 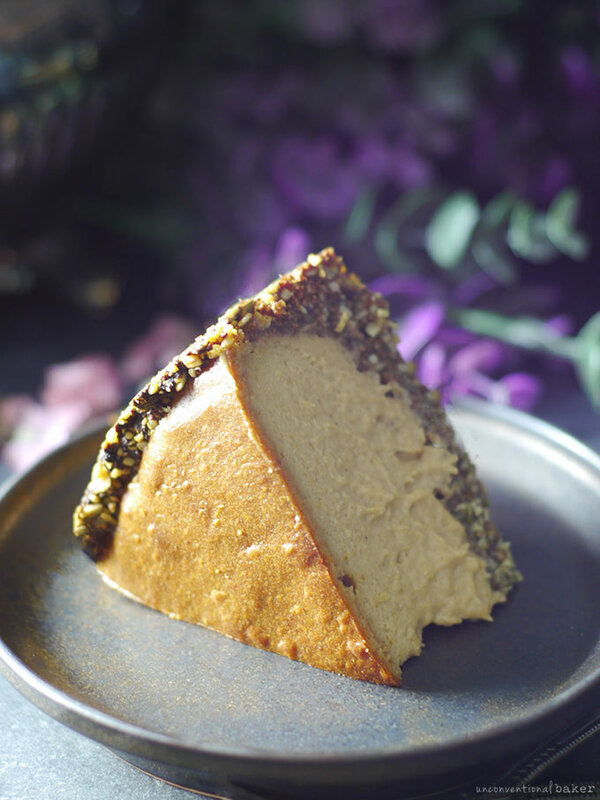 If you’re ok with nut butters, you can make this with cashew butter (there’s a version of that on the blog which is everyone’s favorite), or someone made it with peanut butter and said it tasted great. 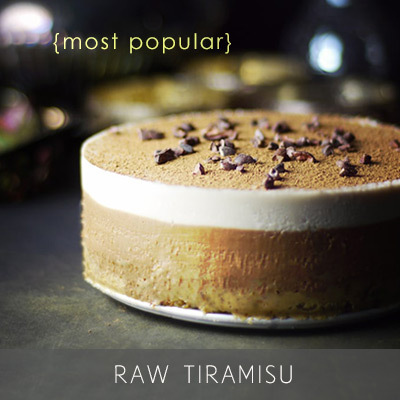 Does raw cheesecake work as well with mixed sunflower seeds instead of cashew nuts? I can’t eat lots of nuts because of histamine intolerance. Almonds, coconut, seeds are fine to me. It depends on the recipe. I make raw cheesecakes with sunflower seeds often, but the flavors need to be adjusted a little differently than with cashews. 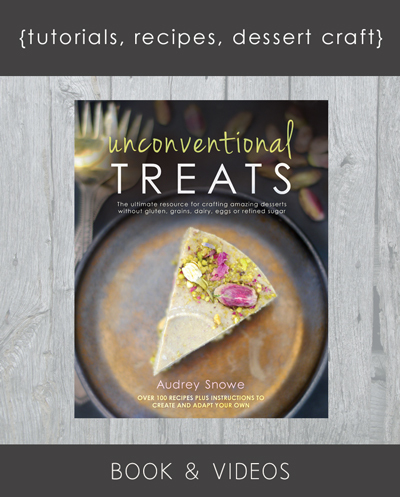 I have a few recipes in my book Unconventional Treats, and was going to share one with sunflower seeds on the blog soon (Stay tuned). So the short answer is: yes. The long answer: you’ll need to adjust the flavors and sweetness some. That said, I have a bunch of non-cashew cakes and cheesecakes on the blog in the recipes section, especially if you check out the nut-free section. Idk what psyllium husk is and where to get it… what is it for? can I skip it or is it essential? Hi Alessandra. Psyllium husk acts as a thickener and a binder in the recipe. It’s also a good source of fiber that’s made out of the husks of a plant. You can find it online or in health food shops, and often the natural section of the grocery store. I find that buying a large package can be costly sometimes, so I just buy a few tbsp at a time from bulk shops as needed and it ends up very cheap that way. You can buy it regular or ground — this recipe uses regular psyllium husk, but if you use ground you need to use less as it’s more concentrated in powder form. I wouldn’t skip it entirely in the recipe. If you can’t find it anywhere, one of my readers used ground chia seeds instead and said it worked great for her, so you could give that a try. 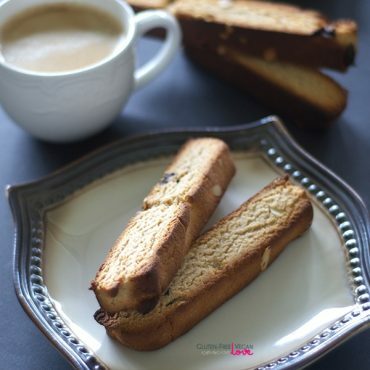 I want to make u compliments for the entire site and for this recipe. I want to ask u another thing aboyt this recipe. I do not use butter or jam and here u can’t really find those types of butter, I’m sure. Is it important for the recipe or can I skip both? If you can’t find sunbutter you can always make your own from toasted sunflower seeds (just put them in a food processor and process until they make a butter (About 10 minutes). You can also use another nut butter if you’re not nut-free — like cashew butter, peanut butter, etc. The jam you can skip. Thank u so much girl! In the end I found them and tbh it was really easy, I had simply never heard of them. BUT i still have some important questions! 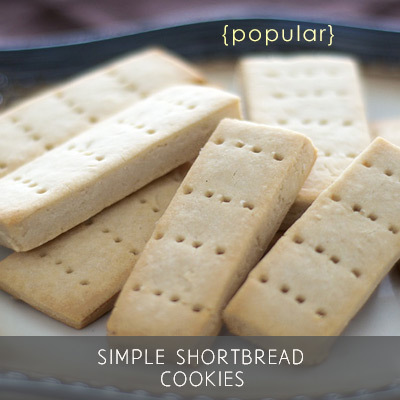 Are they important for the recipe? Can I use something else? More yogurt? More mayple syrup? Almond Milk? Tell me pls cause I would like to bakr this really soon!! Maybe milk? Or is it too liquid? It is too liquid. 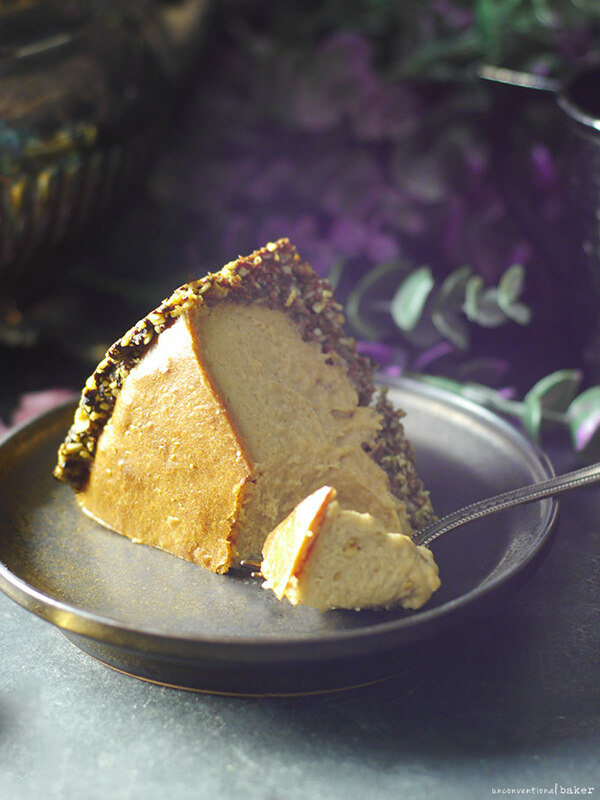 The cashew butter gives a thickness and creaminess, and also that cheesecake-y flavor. If you do just milk it would result in a watery goop in the middle. You can try using extra firm tofu — I got some decent cakes with that in terms of texture, but they didn’t have a correct “cheesecake” flavor (which is created by the mixture of sunbutter & yogurt in this particular recipe). 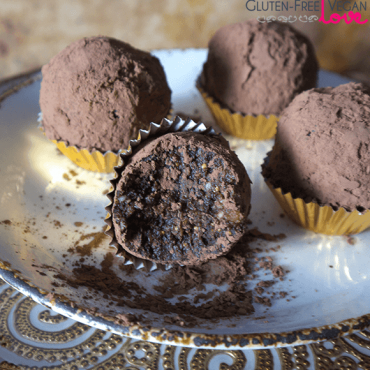 You are always up for a challenge :) I have no trouble with nuts but still think this looks delicious and a fun alternative to nut-based raw desserts! I don’t have a nut issue either, but I really enjoyed this one — somehow the flavor of the strong flavor of the sunbutter mellowed out by the tangy yogurt was just delicious. 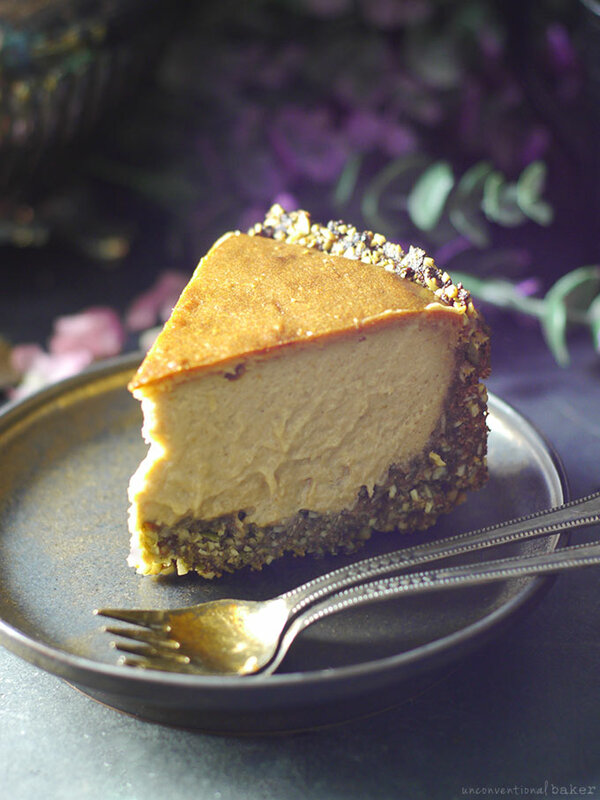 Looks AMAZING Audrey … so intrigued by the sunflower butter … a long time ago I used to make cheesecake with quark and eggs and this looks like it, but prettier, ha ha! Awesome, Tina! Enjoy it. I loved it with the soy yogurt. Oh Audrey, this looks amazing and I want to do it right now!! Unfortunately, I still haven’t been able to get sunflower seed butter. I almost bought psyllium husk once, but the notes on the back on its effects and for kids etc freaked me out of buying it! Can you get away with omitting the psyllium husk from the receipe? For sunbutter — Mayvers makes it. About the psyllium husk, that’s strange — I’ve only heard good things about it for kids up until now (like this and this) — so long as you don’t use too much, and so long as the child doesn’t have a known psyllium sensitivity. The amount in this cake is fairly small, so I wouldn’t be concerned. Apparently kids can have up to 9gr a day, which is 1 tbsp — the amount in the whole cake. You can try omitting it and substituting with a few tbsp starch — I tried something similar in one of my trials and it was ok (can’t remember the amount I used), but the psyllium worked much better without affecting the flavor. Thanks Rebecca :) It is seedy and delicious. I’m holly700 on Ig and just commented on this pic on Insta about how incredible you are! I have a long, complicated personal health history and am overqualified as one who knows about modern day sensitivities but my afflictions have brought much goodness into my life. I have so very much to say about the amazingness of what you’ve been creating but suffice it for me to say for now that what you’ve produced is truly extraordinary. With regards of abundant, karmic joy, Holly. I really appreciate your words. Suffice it to say my baking comes from the same place, which is perhaps why it’s enjoyed by others who have gone through the same.